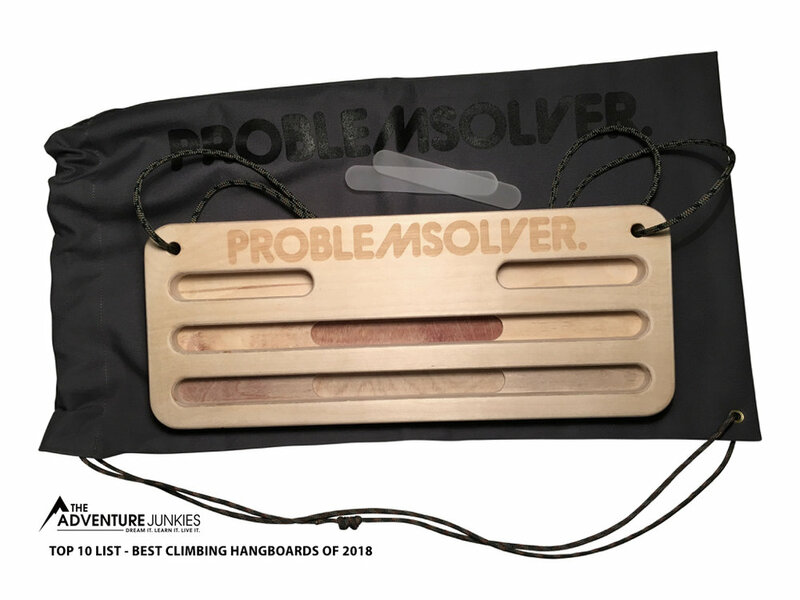 The Problemsolver Training hangboard is our most versatile tool to train finger strength on. It comes with a wide range of fixed holds, so you can easily keep track of your progression. Use our inserts to adjust the depth of the holds even more. With our add-on feature you can train all types of grip strengths. The hangboard is made out of traceable birch and measures 400 x 160 x 24 mm. The holds are 19 mm, 17 mm, 15 mm, 13 mm and 11 mm. You can use them all for two handed deadhangs. You can also do one arm dead hangs by using the center holds which are 19 mm, 17 mm and 15 mm. For mounting, we are using a 4.0 mm accessory cord. The XL version of the Training fingerboard is 30 mm thick and has more rounding on the edges than the standard board. The holds are 25 mm, 23 mm, 21 mm, 19 mm and 17 mm. We have a feature on the backside of the board that enables you to add on holds. That makes it possible for you can train different types of grip positions and get more out of your Training Hangboard. Check out ours. To get even more different grip sizes, the Training hangboard comes with a pair of plexiglass inserts that can be mounted on all the holds but the upper ones. The inserts are 3 mm on the standard hangboard and 5 mm on the XL fingerboard. With that setup you can get holds as small as 8 mm on the standard hangboard and 12 mm on the XL version. When using the tilt, the holds will feel even smaller than that. Check them out in our shop. You can mount the hangboard in different ways to make it easier or harder. Hanging the board in just the front cord, it will tilt backwards and make the holds more incut and easier to hang on to. Hanging the board with both rope ends, the board will be in a neutral position, making the holds more or less 90 degrees. Hanging the board in the back cord will make the board tilt frontwards, making the holds less positive.